Not so long ago, we heard from doctors, especially the practitioners of modern medicines, to avoid our indigenous cooking oils like Ghee and butter in our daily nutrition; advocated the use of refined oils or expensive oils of foreign origin for weight loss. The recent researchers though have busted the myth around desi ghee or clarified butter and its importance of our daily nutrition. In fact, this healthy fat is a must ingredient for your daily nutrition to overcome body dryness and puffiness under the eyes. 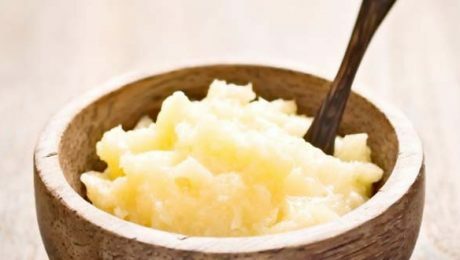 In the past, Ghee being the saturated fat (the fats which become solid when they cool down) received much flak and was branded as a villain by medical fraternity and dietitians in your daily nutrition. You must have seen your elders living close to 100 years, without anybody or heart ailments or even mild condition like constipation, heartburn and acidity etc. The reason behind of all this could be boiled down to one point and i.e. the presence of the good fat ‘Ghee’ in the daily nutrition. Ironical as it may sound, but with a slice of pizza in front of us, we don’t even think twice before polishing it off; but don’t take seconds to brand ‘Ghee’ as an evil in our daily nutrition, that it will mess with our healthy diet plan. In 2016, even the US government concluded that there is no direct link between dietary cholesterol and cholesterol levels in the blood; and Ghee being the best source for saturated fat is an essential ingredient for your daily nutrition. This paradoxical thinking process led us to remove ghee from our daily nutrition. In the journey of branding ‘Ghee’ as an Evil, the advocacy of vegetables refined oils by doctors and dietitians to have contributed a lot; but the bitter truth is that most of these oils are either expensive or have no merits over traditional Indian oils like desi ghee, mustard oil and coconut oil. Soul truth is that Ghee is an essential ingredient for your daily nutrition. Desi ghee can help in improving the digestion by lightening body fire or Agni. It cures the Pitta causing diseases in the body, as Ghee is Pitta pacifying in nature. Most importantly, ghee is known to increase the nutrition value of everything it gets combined with; when combined with milk, it works as Rasayana; an antiaging agent. When combined with turmeric, it becomes a powerful digestive and anti-allergic agent and boosts the body immunity. The ghee produced from cow milk is known for its medicinal values and has a protein called A2 beta-lactalbumin which helps in the health of people who are convalescing. So, start eating ‘GHEE’ without any ‘GUILT’.